That's all folks, thank you for choosing Sport24 for this epic clash between Orlando Pirates and Mamelodi Sundowns. An entertaining game of football despite a goalless draw as the two sides share the spoils. 94' Mahachi drives in a cross that Arendse does well to clear away. 90' The fourth official signals a minimum of 6 minutes of added time. 86' Pirates now looking to hang onto the ball and nullify the Sundowns attacking threat in the final stages. This is the best #AbsaPrem match I’ve watched in a long while. So much quality on both sides. They’ve sustained the intensity for 82 minutes, too! I just need @orlandopirates to convert their ample chances ??????? 78' Ben Motshwari receives a yellow card for a pull back on Zwane. 77' Pirates make a double change as Mahachi replaces Mamela with Gabuza replacing Shonga. 76' CHANCE for Pirates as Lorch plays in a ball for Mulenga who does well to bring it down and get a shot off but is foiled by the onrushing Onyango! 74' Ndengane now also receives a yellow for a wild challenge on Lakay. 73' Kekana goes into the referee's book for a high studs-up challenge on Mamela. 67' Sundowns now make theirfirst change as Lakay replaces Tade. 65' There's a stoppage in play to allow Wayne Sandilands to receive attention...with Pirates forced to replace the injured shot-stopper with Mpontshane. 62' Free-kick to Orlando Pirates as Ngcongca commits a foul on Motshwari. 60' Mulenga who is becoming more dangerous as the game continues goes on a driving run from the left flank but skews his shot wide of the target. 57' Pirates win the ball back high up the pitch and Mamela looks to play in Lorch but his pass is just overhit and runs out of play. 54' Mulenga plays in a left-footed ball over the top for Lorch but the tracking back Morena does well to knick the ball away just in time. Bucs had 6 corners in the first half. None used. Downs had five. None used. None of the free kicks worked too. 47' Lorch picks up a yellow card for a late challenge. HT || @orlandopirates 0-0 @Masandawana. It had all the makings of a humdinger and it certainly lived up to its billing. An action-packed half of football comes to an end with both sides going into the break on level terms. #AbsaPrem this game is lit. An entertaining first-half with the flash-point Maboe escaping with only a yellow card for a late lunge on Mamela. The fourth official sgnals 2 minutes of added time. 42' Tade hits a long-range shot that Sandilands does well to parry to keep the scores level. 40' Pirates again playing some scintilating stuff on the edge of the Sundowns area as Lorch hits a bending effort that Onyango does well to hang onto. 33' Tade now goes into the referee's book after hacking down again Mamela. 31' Mamela breaks through the Sundowns defence as Maboe tracks back and hacks the attacker down just outside the area. Maboe escpapes with only a YELLOW card!... Moment of the game so far. 28' CHANCE! Onyango denies Mulanga from an acute angle as the striker hits his effort across goal but the goalkeeper did well to get down to his right and make the stop. 27' Tade hits a curving free-kick to the far post that Sandilands does well to tip over for a corner. 25' Sundowns now turning the screw on the Pirates defence as Zwane cleverly win a free-kick down the left flank. 24' Maboe again with another chance as he cleverly creates space on the edge of the box but hits his effort just over the crossbar again. 22' Afrantic passage of play with Sundowns putting the hosts under pressure as Maboe hits a snapshot high over the crossbar. 15' Kekana hits a thunderous long-range effort that Sandilands just manages to awkwardly tip over the crossbar! 13' Langerman breaks down the left flank and heads to the byline but Dube gets in a last-ditch tackle to concede a corner. 12' Pirates now looking dangerous by putting together a few passes in the final third with an attempted move breaking down as Mamela overhits a cross to the far post. The fourth official indicates seven additional minutes to be played. A scary moment for Pirates as Jele's back-pass nearly finds Morena, but Mpontshane clears. CHANCE FOR PIRATES! A punt forward finds Lorch in the box but he has an air shot. The player has been cramping and maybe that put him off. Full time: Orlando Pirates 0-0 Mamelodi Sundowns. A share of the spoils in a tight game. Both sides had numerous first-half chances but Pirates had more of the play. The second half was a tight affair. Sundowns have an opening as Maboe beats Jele on the flank, but the defender recovers well to get back and block Maboe's attempt to find Morena. After a quiet period, Pirates win a corner after Langerman heads behind. Pirates take it quickly and win a second corner as Onyango tips over Maela's up-and-under. The second corner comes to nothing. 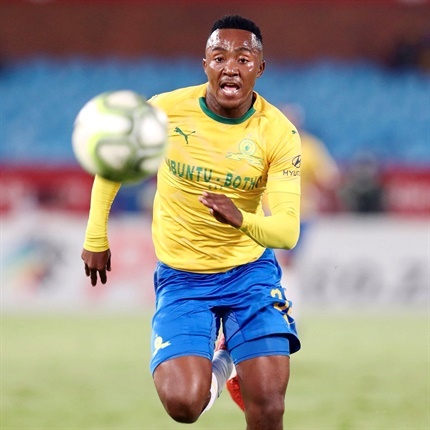 Sundowns have an openings as Morena, now playing as a striker, leads a counter attack; Lakay finds Zwane who dribbles past Jele and fires off a shot, but Mpontshane saves well. Pirates have a good attack and have attempts from Mulenga and Maela blocked. Yellow! Ben Motshwari gets cautioned for Pirates for pulling back Themba Zwane. DOUBLE SUB: Kudakwashe Mahachi replaces the injured Luvuyo Memela for Pirates, and Thamsanqa Gabuza takes the place of Justin Shonga. CHANCE FOR PIRATES! Lorch picks out Mulenga's run in the box, but Onyango smothers the shot well. Kekana tries his luck from the resulting freekick, but Mpontshane saves well. Yellow! Ndengane goes into the book for Pirates after a late challenge on Lyle Lakay. Luvuyo Memela is down injured now, after Kekana caught him with his studs on the knee. That looked painful and he may not be able to continue. Yellow! The referee has belatedly decided to caution Kekana for that challenge. Dube is down receiving treatment for Pirates. This has been a very stop-start second period so far. 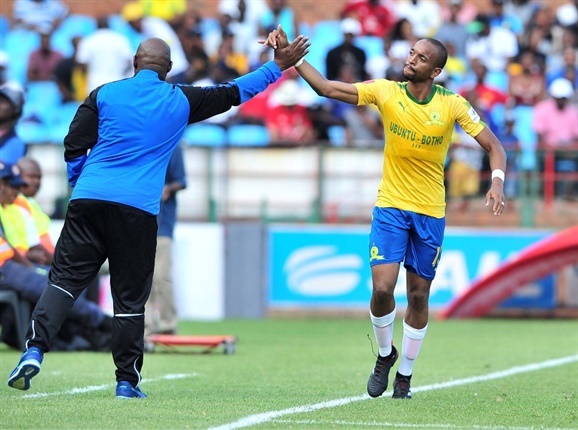 SUB: Lyle Lakay replaces Emiliano Tade for Mamelodi Sundowns. SUB: Siyabonga Mpontshane replaces Wayne Sandilands in goal for Orlando Pirates. Sandilands is down again, struggling with what looks like a concussion. His evening is seemingly over. Ngcongca brings down Motshwari and Pirates have a freekick in a promising area. Mulenga links up with Maela on the left for Pirates and hits a shot, but it slices wide. Pirates catch Sundowns on the break yet again, but Langerman makes a crucial tackle on Shonga after Mulenga's cross finds his fellow Zambian in the box. We are back underway after Sandilands gets a quick stitch in his lip. Tade whips in the freekick, but Sandilands punches clear under pressure and has a bleeding lip for his troubles. He is down receiving treatment. Yellow! Lorch rakes his studs down Tade's foot and goes into the referee's book. Tade has the first shot of the second half, but Ndengane blocks well. The second half is underway here. The fourth official indicates two minutes of additional time to be played. CHANCE FOR PIRATES! Excellent play from Mulenga and Memela sees Lorch arrive with the ball in the box, but Mabunda and Nascimento crowd him out just as he is about to pull the trigger. Memela hits a swerving shot for Pirates but Onyango parries the shot wide. 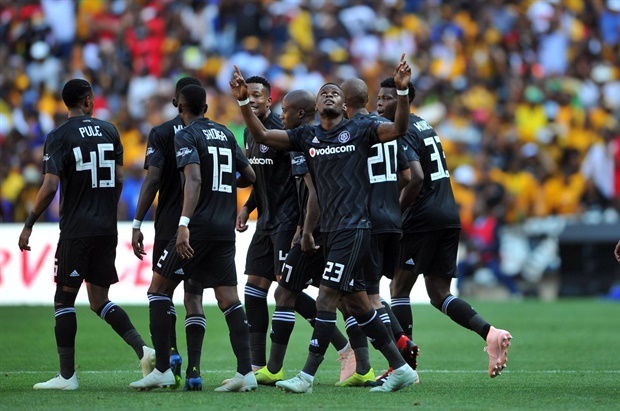 Another shot for Pirates as Lorch unleashes a powerful effort from long-range, but Onyango saves nonchalantly. Kekana finds Maboe with a long pass and he knocks the ball down for Tade to strike from range, but Sandilands pushes the shot around the post. Pirates play some more excellent football and it leads to Motshwari testing Onyango after Lorch's backheel. Zwane is next to have a crack as he finds space in front of Maela and fires his shot wide of goal for Sundowns. Pirates launch another counter and Mabunda has to hack down Dube. He is very lucky to avoid going into the book there. Memela delivers the freekick and Nyatama gets his head to the ball, but he diverts it wide. A decent opening. Yellow! Memela beats Tade on the right flank and is pulled back. Tade goes into the referee's book. Shonga strikes the resulting freekick, but it's blocked by the Sundowns wall. Yellow! Pirates hit Sundowns on the counter-attack and as Memela runs into a great position to strike, Maboe hacks him down. Pirates want a red card but the ref deems Sundowns to have had covering players. Tade delivers another cross for Sundowns from the left, and Jele has to clear well under pressure from Nascimento. 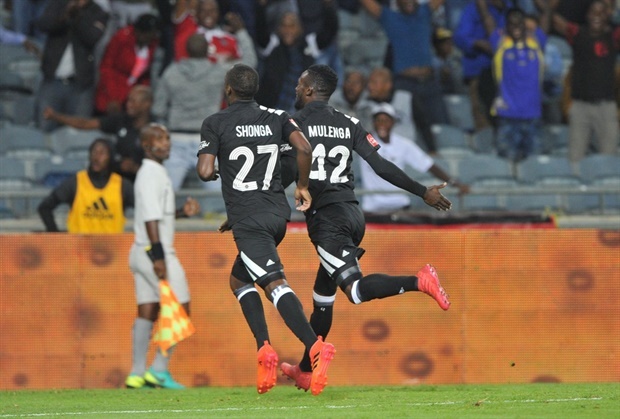 Lovely play from Pirates as Lorch and Memela link up to set up a shot for Mulenga, but Onyango gets down well to save. 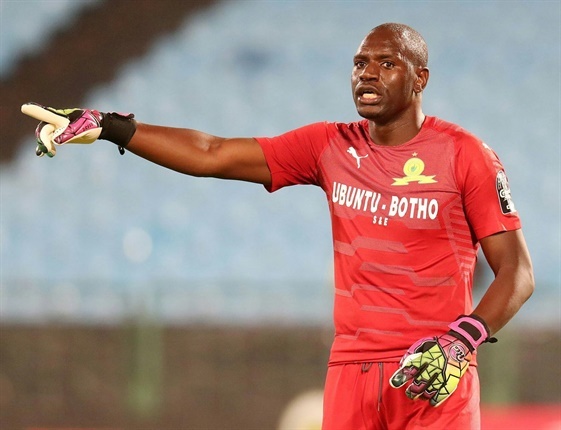 Tade delivers a dipping freekick from the left for Sundowns and it appears to be heading for the top corner before Sandilands touches it over the bar. Nyatama hacks down Zwane and is lucky to escape a yellow card. Zwane is taking a real kicking from Pirates tonight. Maboe makes space for himself and fires off a shot, but it flies over the bar. Sundowns have a great spell as they pen Pirates into their own defensive third, but the move leads to Maboe skying his shot. Pirates win a freekick on the right as Mulenga is brought down by Langerman. Kekana hits a shot from long-range which Sandilands makes a meal of, but the 'keeper manages to tip the shot over the bar. A nervous moment there. Sundowns win their first corner as Dube crunches into a tackle on Langerman. Pirates break quickly, but Motshwari is slow to release the pass and the flag goes up against Mulenga. Mulenga has a shot straight at the goalkeeper for Pirates after a great pass by Nyatama on the counter attack. A scary moment for Onyango as he fumbles Lorch's cross into his own net, but the flag had already gone up for a goalkick as the cross curled out. Pirates win another corner as Shonga drags Arendse wide and has a cross blocked. Lorch is fouled from the resulting short corner by Zwane and Pirates have a set-play on the left. It comes to nothing as Kekana heads clear. Memela has a shot for Pirates as he runs onto Mulenga's pass, but Nascimento blocks well and it goes out for a corner. Sundowns have another opening as Maboe and Zwane combine, but Sandilands cuts out the low cross. Referee Abongile Tom blows the whistle and we are underway here. An early chance for Sundowns as Langerman flies past Dube on the right and crosses low for Morena, but the shot is dinked just wide of the post. Hello and welcome to tonight's live coverage of the crucial ABSA Premiership clash between Orlando Pirates and Mamelodi Sundowns from Orlando Stadium. Kickoff is at 7.30pm local time. Orlando Pirates starting XI: Sandilands; Dube, Jele, Ndengane, Maela; Motshwari, Nyatama; Mulenga, Lorch, Memela; Shonga. Orlando Pirates substitutes: Mpontshane (GK), Munetsi, Mabaso, Mahachi, Qalinge, Makola, Gabuza. 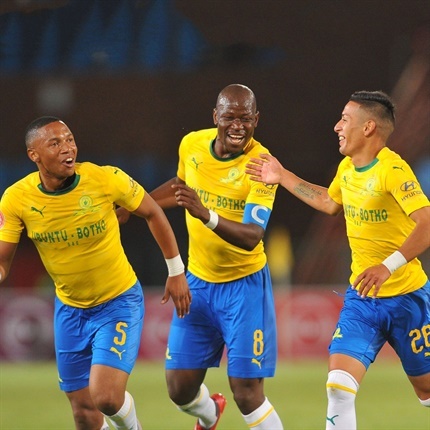 Mamelodi Sundowns starting XI: Onyango; Ngcongca, Arendse, Nascimento, Langerman; Kekana, Mabunda; Morena, Tade, Zwane; Maboe. Mamelodi Sundowns substitutes: Mweene (GK), Coetzee, Lebusa, Lakay, Manyisa, Meza, Vilakazi. Please note: Kickoff has been delayed for 15 minutes due to fan delays in getting into the stadium.